Even Walt Disney himself is said to have ridden a House of David miniature train, and possibly even have taken one back to California with him in the beginnings of Disneyland. Starting in 1905, the House of David built 8 of their own miniature trains, all right there on the colony grounds, using their own craftsmen and making all their own tools and molds for the train's parts with passenger cars to follow these steam engines. The public was shown and magnificent journey around their perfectly manicured park grounds, and the sound of the old steam engine whistle is talked about even today. In 1948 a group of light new steam engines were built, along with new passenger cars, and the older models were eventually sold off to the public. 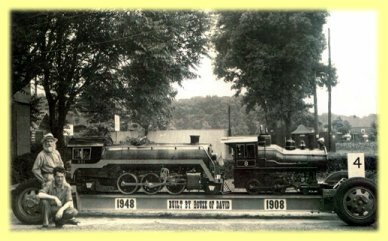 The House of David Museum seeks the whereabouts of these first five steam engines and their cars, along with the later 1948 versions with stainless steel finish on the engines themselves, along with the possibly old movies showing these miniature trains in action.